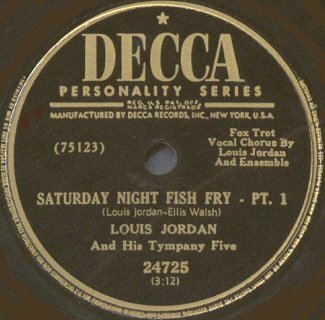 "Saturday Night Fish Fry - Part 1 & - (Concluded)"
Above: Photo of Louis Jordan And His Tympany Five from the 1946 movie "Beware". 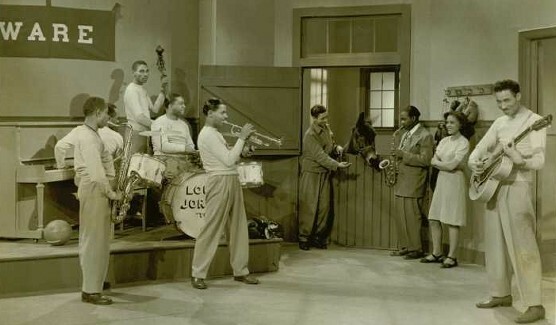 Band members in photo are Louis Jordan (alto sax - near doorway), Eddie Byrd (drums), William 'Wee Willie' Davis (piano), Carl Hogan (guitar), Aaron Izenhall (trumpet), Joshua W. Jackson (sax), and Jesse Simplain (bass). Yes, this does add up to more than five! To view an article about Louis Jordan at the Arizona Blues Hall Of Fame web site, please click HERE. Above: Photo of Louis Jordan's Backup Singers. They are Elaine Robinson and Ann Bailey. The inscription is "Best Wishes from the Girls! Louis Jordan 1/31/53". Above: Label image of Decca 24725. The flip is "Saturday Night Fish Fry - (Concluded)". 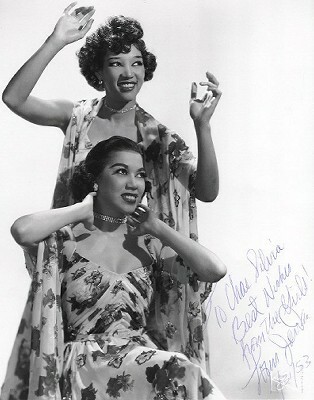 It was a big hit in 1949, topping the R&B charts for twelve weeks.